Choose View→Master→Slide Master from the menu bar. Click the Slide Master tab of the Ribbon, and within the Slide Master group, click the New Layout button. PowerPoint places a new Slide Layout in the Slides pane. The logical hierarchy is to first create a common look for all your slides and then make subtle differences in the Slide Layouts. When you format a Slide Layout so that it’s different from its Slide Master, that particular layout, as well as slides in the presentation based on that particular layout, display the Slide Layout’s different formatting. After you format a Slide Layout, you can get different results when you go back and reformat the Slide Master. Content: Makes a content placeholder for text and has six buttons, one for each kind of content. Vertical Content: Same as content, but sideways. Text: Makes a content placeholder for text, but has no buttons for other kinds of content. Vertical Text: Same as a text placeholder, but sideways. 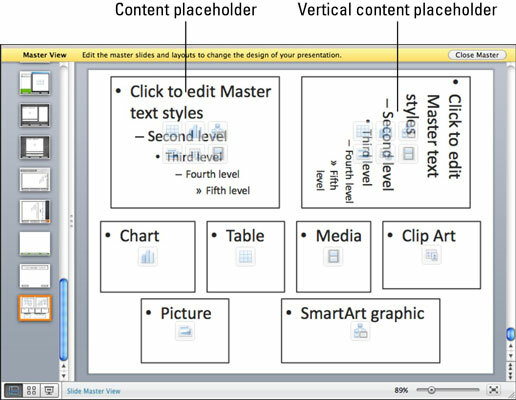 Chart, Table, Media, ClipArt, Picture, or SmartArt: Makes a single-purpose placeholder for the chosen media type. Just like the Slide Master, you can format all the placeholders on a Slide Layout. Any slides that use that particular layout get the changes that you make to the Slide Layout. But remember that when you change formatting on a Slide Layout, you’re breaking the link for the changed placeholder or element between that Slide Layout and the Slide Master. Subsequent changes to the Slide Master will not be passed on to a modified Slide Layout.